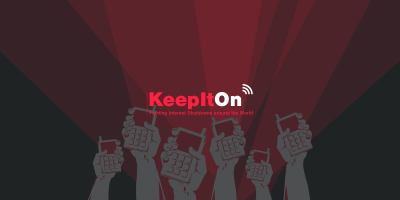 Together with more than 100 organizations around the world in our #KeepItOn campaign, Access Now is fighting to keep internet shutdowns from becoming the new norm. Today, we’re participating in a talk at the Brookings Institution about how this dangerous, rights-harming practice impacts local economies (connect to the live webcast here). Another way we’re fighting shutdowns is by documenting the justifications governments use to carry out shutdowns and impose blanket restrictions on platforms for expression. Orders to block, throttle, or disrupt communications networks almost always fail to comply with local law. They also face growing international condemnation as an interference with human rights that’s not justified even in times of conflict. Here’s a look at what governments say, versus how internet shutdowns truly affect people. National security may be the most frequently cited justification for internet shutdowns globally. It’s also the broadest and most vague. In Pakistan, the government has made localized mobile network shutdowns justified on these grounds a standard practice, cutting people off from the network during Islamic holidays such as the day of Ashura, while citing concern about terrorist attacks. Orders for the shutdowns are meant to cover a relatively small area, but it usually becomes necessary to “shut down a wider area than specified, to ensure there is no ‘spillover’ of service,” according to the Institute for Human Rights and Business. This means that the majority of mobile internet users in Pakistan are often affected. State authorities have also cut off the internet for “security” during a wrestling event and Independence Day celebrations. In Turkey, during the coup d’etatattempt in July 2016, social media sites were throttled. Shutdowns imposed in the name of “national security” have the opposite effect on the people cut off from communications platforms and online resources. People don’t feel “secure” or safe when they can’t figure out what’s going on, can’t get access to important news or reach emergency services, and can’t check in on their loved ones. Shutting down the internet or otherwise controlling the free flow of information online during an election period is a profound violation of human rights and a threat to democratic processes and government legitimacy. Fighting shutdowns during elections is part of Access Now’s DNA. When the government ordered a disruption in Iran during the2009 elections, it convinced a small group of activists and technologists to found our organization. Sadly, Iran is far from alone in this practice. In 2010, Myanmar repeatedly shut down the internet in the months surrounding its first elections in 20 years. In October of last year in India, the government used local elections to justify a day-long shutdown in Garo Hills region. Worryingly, there has been a series of shutdowns during or around elections over the past two years in countries in East and West Africa, with governments disrupting the internet, cutting access to social media, or carrying out full blackouts in Chad,Togo, the DRC, Congo-Brazzaville, and Uganda. Citizens are fighting back. In Uganda, when the government blocked Facebook, Twitter, and WhatsApp on election day, people circumvented the blocks using VPNs and other circumvention technologies, making the government’s crackdown on free expression less effective. Yet as a result, we estimate that the mobile banking sector — a popular form of exchanging money — lost $23 million per day over a weekend. At Access Now, we’re continuing to fight this trend through the #KeepitOn campaign, and we’re starting to see progress in Africa. Civil society won a hugely important victory when the president of Ghana told voters that the government has no intention of shutting down social media on election day, even though the police had been openly considering it. Shutdowns prevent journalists, election monitors, and ordinary citizens from reporting fraud or irregularities at polling places. Opposition candidates and parties cannot communicate with supporters or expose and document illegal activity. Bahrain, Cameroon, Chad, Democratic Republic of Congo, India, Iran, Kazakhstan, Libya, Mali, Myanmar, Sudan, Syria, Uganda, the United States, and Venezuela. A violent protest might theoretically justify extraordinary security measures, but imposing internet blackouts when people are protesting doesn’t increase safety. It stops important information from reaching citizens — like how to find areas of safety or contact emergency services. It also prevents people from documenting human rights violations such as the disproportionate use of force by the police or military. After that, in June 2015, Iraq shut down the internet for national exams, and did so again one year later. This year, a full-blown trend emerged, with governments in India, Algeria, Ethiopia, and Iraq each turning off communications networks during national exams. This type of shutdown is a clearly disproportionate practice, impacting the free expression rights of millions of people to stop cheating by a few students — who might nevertheless develop other ways to cheat. What the government says: It’s to keep the dignitaries safe. Governments sometimes see a national security risk when government officials or foreign political leaders are visiting, and use the risk to justify shutting down the internet. One of the earliest examples we’re aware of took place three years ago in Pakistan when the government ordered a disruption during the visit of the Chinese Premier Li Keqiang. More recently, authorities in the Indian state of Jammu and Kashmir blocked mobile internet during Prime Minister Modi’s visit to the Kashmir Valley. The people of Kashmir have experienced more shutdowns than those living in any other state in India, but this may have been the first time justification was tied to a high-profile visitor. Similarly, in the Philippines, the only shutdown we recorded took place last year during a visit by Pope Francis. It was supposed to be a targeted disruption of the area along the Pope’s travel route, but other areas were impacted to prevent spillover of signals. And in May, the Vietnamese government blocked Facebook when U.S. President Obama visited. Disruptions like these interfere with our right to receive and impart information, a right that is not suspended when dignitaries visit. And the rationale is questionable. In Vietnam, for instance, did the government impose a shutdown for “national security,” or to censor news about the protests that were happening at the time? As these examples show, countries use a variety of rationales for internet shutdowns, and depend upon different laws to legally justify those reasons. In some cases, what makes the difference for whether an internet shutdown will be implemented is the licensing requirements between a government and a telecommunications company. These requirements can create “excessive intermediary liability,” where a company is compelled to comply with shutdown orders even when they are extralegal. Yet push-back remains possible, through industry-led coalitions like the Global Network Initiative, and by appealing to national parliaments and other institutions. A key victory on the international front came when the United Nations passed a resolution in June 2016 that specifically condemns internet shutdowns. This demonstrates the growing global consensus that internet shutdowns are a human rights violation that cannot be justified even in times of conflict. It is now up to us to help establish new norms and laws that disallow shutdowns regardless of rationale, with the support of civil society, industry, academia, and individual internet users from all around the world.